SEDtronic 1-Wire sensors are sensor modules for environmental monitoring which can together with temperature measure humidity and light intensity. Some models also include digital input or analog input. All SEDtronic 1-Wire sensors come with 60 mm mounting bracket for electrical outlet boxes. Sensor modules com in several variants. A module without humidity measurement can be equipped with signal LED diode. There are also other options where the module can be used as digital or analog input (logic level 5V, analog 0-5V). These modules are compatible with Schneider Unica wall switches. The resulting installation offers an aesthetical and practical solution, combining sunken wall switch with colored LED light and temperature sensor, all in one box. *We do not provide water-resistant module variants. It is possible to order SEDtronic 1-Wire sensor with or without 60 mm mounting bracket for installation into universal electrical wall box – diameter 60 mm. Measured voltage 0-5V can be connected between the ground terminal GND and terminal AO when using analog input option. 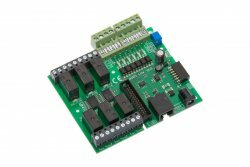 When using the digital input option – the potential-free contact is connected between the power terminal +5V and terminal AO. It is necessary to observe the max. the distance of the contact from the module at 20 m.
Control of the sensor is possible with Mervis and REX or custom user scripts.